The bride can select from a variety of bridal or evening shoes from a bridal boutique or online wedding store. If the bride wants to add a bit of height which can boost confidence on this special day, she can go for heels. There are many styles of high heel wedding footwear. The bride can wear a stiletto heel, open or pointed toe heeled shoes as well as closed toe. High heels will help to elongate the bride-to-be legs and the footwear can go well with any style of wedding gown. The bride-to-be can also select wedge shoes to wear during the wedding occasion. Wedge shoes come in different designs especially the ones that will be perfect to wear for a wedding. There is the trendy chunky wedge footwear, wedge platform wedding shoes and other wedges such as canvas. Choose the wedge footwear that will make you walk comfortably during the bridal event. 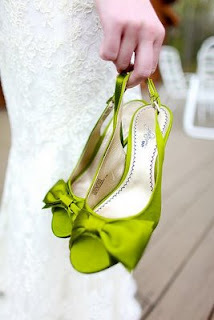 If the wedding is to be a beach wedding, there is no reason for the bride to have on kitten heels or heel sandals. The bride can wear flats. Ballet pump or flip flops are the best selection for any beach destination wedding. The bride and other bridal party do not want to walk on the sand with sinking shoe heels. A thin soled pair of sandals will be perfect for a summer evening garden wedding party in the garden. The bridal shoes come in many different colours such as, taupe, navy, black, white bridal shoes, purple, green and many others. The wedding footwear can have any kind of embellishments such as beads, rhinestones, pearl, ties and straps. Many of the bridal shoes are really pretty and have the added bonus of being very comfortable shoes. The bride may also choose a style of bridal shoes that she will be able to wear to other formal occasions long after the wedding event is over.